Francis Palms was the first to purchase land in the area, buying it up as quickly as it became available for purchase. According to some records, he purchased some of the land for as little as $1.25 an acre while obtaining additional lands at little or no cost under various Acts of Congress that made land available to homesteaders and investors. Although the Knox Brothers established a company town named Knox Mills, about five miles south of what would later become Brantwood, their logging and lumbering influenced the settlement of Brantwood as well. In 1890, Samuel Knox sold his share of the land to his brother, William. William began the expansion of his logging business by building a mill. 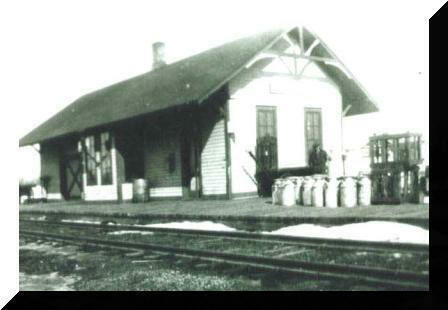 The Minneapolis Sault Ste Marie and Atlantic Railroad (Soo Line) ran east and west about five miles north of William’s mill. He persuaded the railroad to build a spur down to his mill. The point where the spur joined the main railroad line was named Knox Junction. Although the exact date of changing the name from Knox Junction to Brantwood is unknown, when the post office was established there in January 1895 it was named Brantwood. It was also in 1895 that William Knox began selling off the cut over land by enticing more immigrant settlers to the area with advertisements of land at bargain prices. E. H. Hobe was an agent for the railroad and was delegated the task of encouraging buyers for the land. Mr. Hobe was also the Swedish-Norwegian Vice consulate and a realtor. These roles put him in contact with Norwegians in Iowa and Minnesota where he marketed the lands belonging to William Knox and the railroad. Finnish immigrants were also targeted with advertisements in several Finnish-American newspapers. The ads boasted of rich agricultural farmlands at cheap prices ready for planting. Many immigrant families bought acreage, sight-unseen, and began their journey to another new location inspired by dreams and fueled by hope. Some families traveled far distances in wagons that they had carefully packed with their possessions. As they trekked from Minnesota, Iowa and western states, they pulled along a few livestock tied to the back of their wagons with the children walking alongside. Other families reached the area by train, disembarking at the Brantwood Depot. Some of these folks settled in Brantwood while others walked the last five or ten miles of their trip following the railroad spur south into Knox Mills. Some families had friends or relatives already settled in the area that opened their doors to the newcomers and while others stayed in one of the boarding houses that William Knox owned and operated, a few settlers purchased land parcels that included a house that they moved right into. As the area became more populated, roads and schools were needed. Local taxes had to be increased to pay for these additions and improvements. In an attempt to exempt their lands from the tax increases, the big landowners, including Knox, appealed to the county board. The result was a change in the boundaries and the formation of new townships. In addition to the Towns of Prentice, Hackett and Hill came the Town of Knox established on 19 November 1895. In 1896, E. H. Hobe purchased the failing milltown of Knox Mills from William Knox who had removed the sawmill and the railroad spur. After Hobe built his own mill and had rails re-layed, he focused on selling acreage in the community of Brantwood. Under Hobe’s influence, the communities of Brantwood and Knox Mills rapidly grew simultaneously. By the spring of 1898, Brantwood had a lumberyard, warehouse, two hotels, a boarding house, post office and Sunday school. In 1899, C. R. Sorenson established a mercantile. Roads were built between these two young communities that were booming with the logging business. According to the 1900 US Federal Census, 411 men, women and children were living in the Town of Knox. Brantwood was home to 288 folks and Knox Mills home to 123. Nearly half of the families were Finnish immigrants who had settled in Brantwood while many of the Norwegian and Swedish folks had settled in Knox Mills. The remaining census population consisted of transient loggers and mill workers, both foreign and American born. The communities of Knox Mills and Brantwood continued to grow and thrive for another twenty-some years until the logging industry started winding down. The economy slowly changed, families moved away and people grew old and died. With little to entice new residents to the area, Knox Mills eventually disappeared and the area was absorbed as part of the greater Brantwood community. A comparison of the Platt Books from 1910 and 1957 shows the land ownership in the Town of Knox and how it changed. T. 35 N., R. 3 E.
Socialist and Communist movements of the era. Brantwood eventually changed as well as it lost local businesses to the larger surrounding communities. Many families still live in the area farming the lands their grandfathers and great-grandfathers cleared. A few logging trucks still transport second growth timber from the forests and several tree farms supply Christmas trees to southern states. Today, if you drive along any of the roads in the Township of Knox, you can find shadows of the past. Remnants of barns and silos, overgrown pastures and patches of flowers growing wild where a farm house once stood will remind you of a community that was once alive with activity. And on a quiet summer night you can still hear the whistle of the Soo Line as it makes it way across Towns 35 and 36 North, Range East in Price County. With more than 100 years of history it is impossible to tell you everything about the communities of Brantwood in this brief history. Next time you are in the area, stop in and chat with the curators of Knox Creek Farm and Knox Creek Heritage Center, both located near the intersection of W. Knox Road and W. Central Avenue, they will share their wealth of knowledge about the community with you as you browse through all the historical artifacts they each have collected.